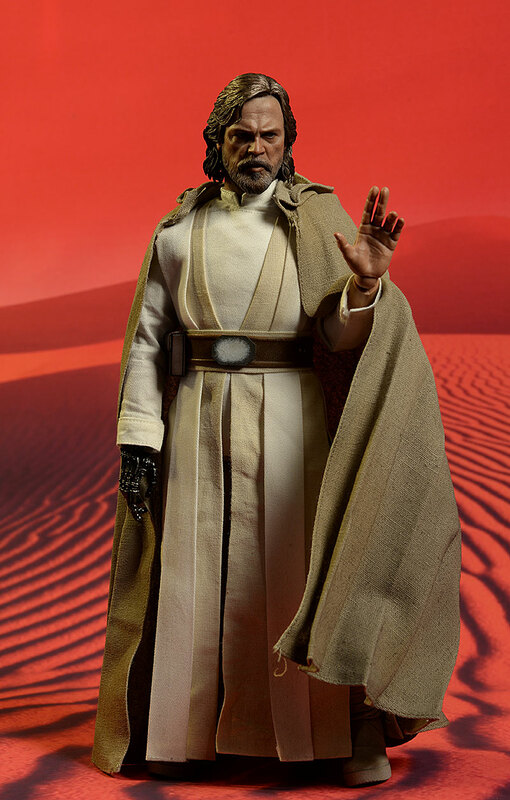 His brief appearance in The Force Awakens is the basis for this latest figure from Hot Toys. The older and potentially wiser - or maybe not - Luke has his cool robes but not much else, living a rather hermitic life on an island. The figure will run you around $230, depending on the retailer. Nothing too exciting, due in part to the constraints imposed by the license. The shoe box design is standard stuff, and the interior card art is attractive but not unique. It's all collector friendly, and the single plastic tray keeps the figure and accessories safe. I'm not that guy - I never see a head sculpt and say "It looks more like X than Y!". In fact, I usually find it pretty annoying when people do, since all actresses and actors are attractive (okay, most are), and this means they also look a lot alike. If you don't know about the Golden Ratio, look it up. 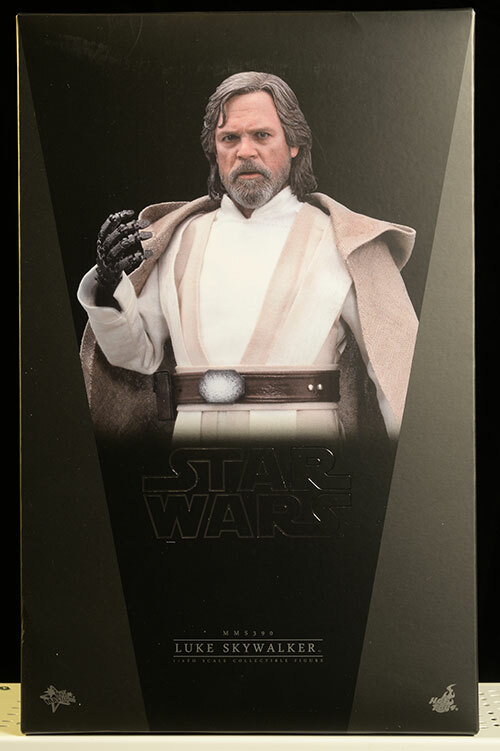 But I'm going to be that guy this time, because I can't look at this sculpt and NOT see a younger Jeff Bridges. I think it's the structure of the overall head, which is a little too long and tall for Hamill. His face is a little rounder, and little shorter from the top of the head to the tip of the chin. That's not to say I can't see some of Mark in this portrait. The eyes and nose aren't far off, and from the right angle and in the right light, it's closer. But this is not the prototype, and something subtly changed from the pre-production version to this final release. 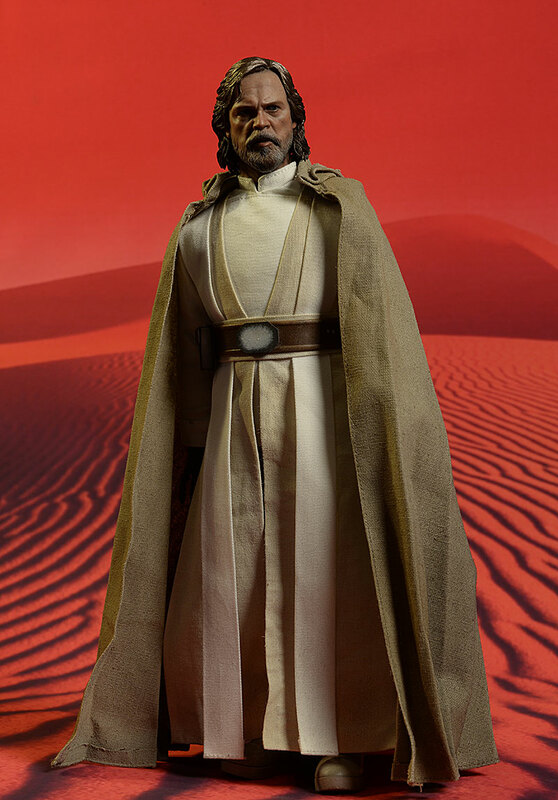 Of course, the realism is fantastic - this is a Hot Toys sculpt, after all. The detailing in the finely stranded hair is amazing, and the skin texture and beard look excellent. The expression is reasonably good as well, with slightly parted lips and the eyes looking to his left. 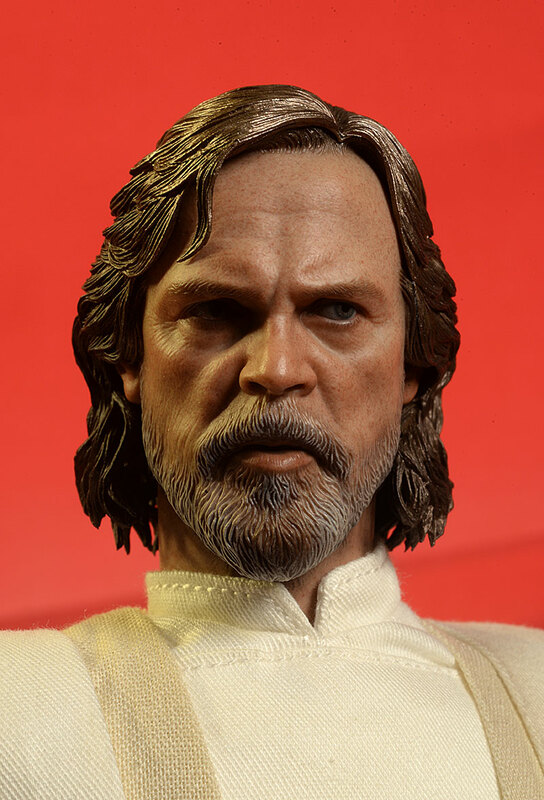 It's a serious look, and I suspect Luke is going to be a very serious character in the next film. The portrait isn't the only thing off this time around. 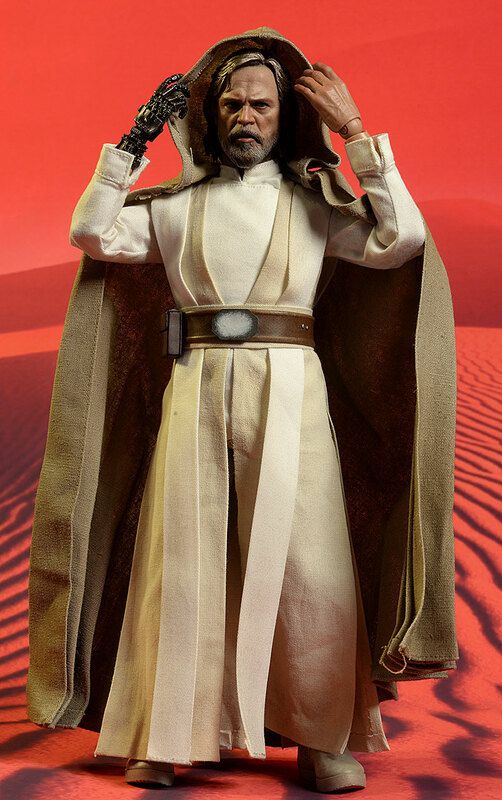 Even worse are the giant mitts, a problem that seems to come and go with every Hot Toys release. Here, his hands are much too big, especially when they are splayed. It really seems there's no excuse for it at this point. 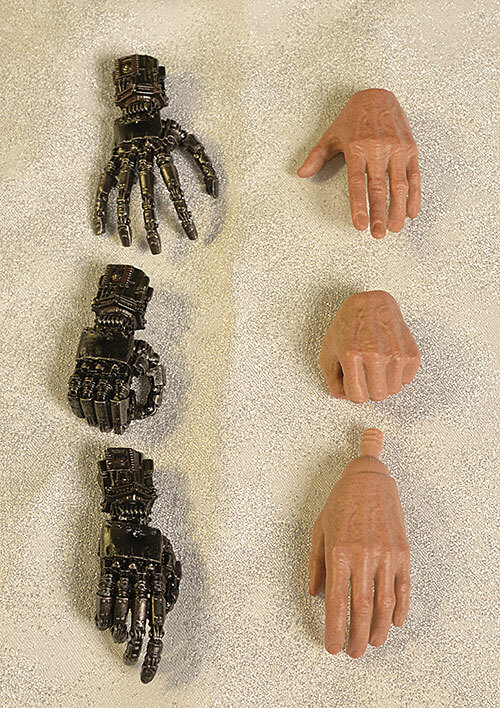 The sculpts on the robotic right hands are good, but again, the fingers are super long. At least you could make the excuse that it's not a 'real' hand, and maybe he wanted E.T. fingers on his prosthetic. Hot Toys production paint work remains amazing, and the skin looks realistic and tanned. It's too dark - no doubt about that - but I'll give them a slight pass here considering his outdoorsy lifestyle. The hair line has a nice, subtle transition, and there is very little bleed into the eyes. They've dry brushed the beard with a little gray, and while it's not a perfect effect, it works fairly well in hand. My biggest issue is with the hair. I've discussed before about the problems with doing gray or blonde hair - getting the color right on a plastic figure is almost impossible. Light hair has a translucence that catches the light in just such a way, and painted plastic can not mimic the look easily. 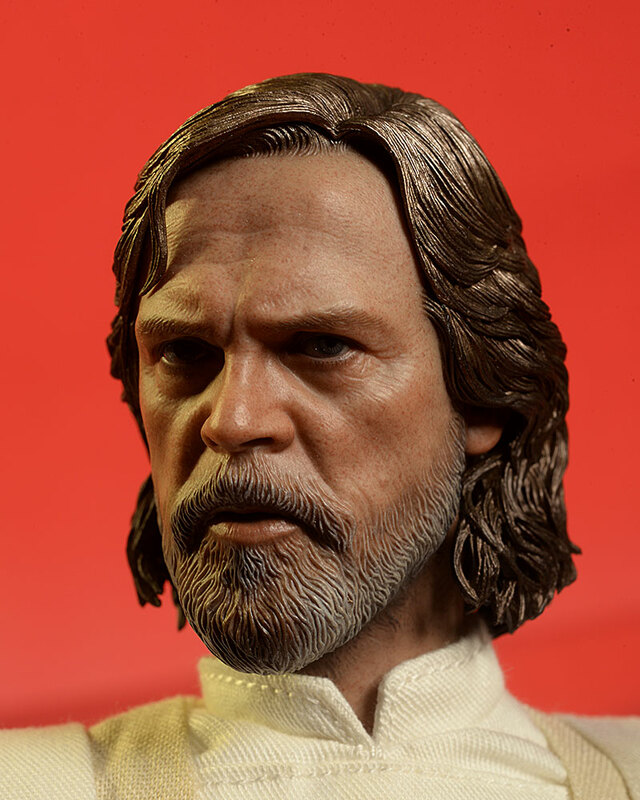 This aged version of Luke is particularly tricky. His hair is part dirty blonde, party gray old man. They decided to go with a gold top color with a darker color underneath, and it was a valiant attempt. If they had gone with a more matte look, it might have worked, but instead they went with a very glossy finish, almost like metal. This is one of those rare occasions where I think it actually looks better in photos than in hand, where the bright bronze color looks more out of place. The underlying TrueType has all the articulation you expect, and you can get some nice, fluid, life like poses. However, this particular figure has a few restrictions due to it's design. The neck is the first spot where he's slightly less mobile. The one piece neck and head means all the work is done by the ball joint down in the torso. I'm not sure why they went this route, since the hair and beard would have hidden any joint below the jawline. The shoulders, elbows, hips, and knees all work as expected, and the padded clothes (he's puffed up through the torso) don't create a problem for these joints. The torso is a little less mobile due to the padding, but it's a minor nit. The ankles should work pretty well thanks to the two piece boot design, but they are still a lot less mobile than I expected. It was tough to get the feet flat on the ground in any medium to wide stance. The one missing joint is the right wrist. 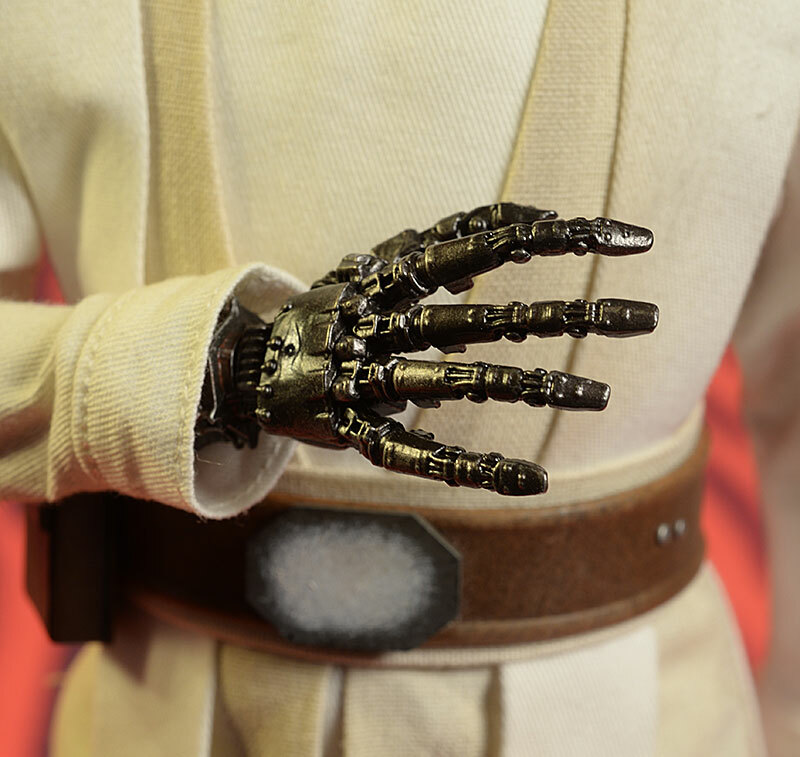 Because of the robotic hand, the wrist and hand are all one piece. The hand pops on and off a straight peg on the forearm, which means this hand can only turn. Here's where he really takes a hit. 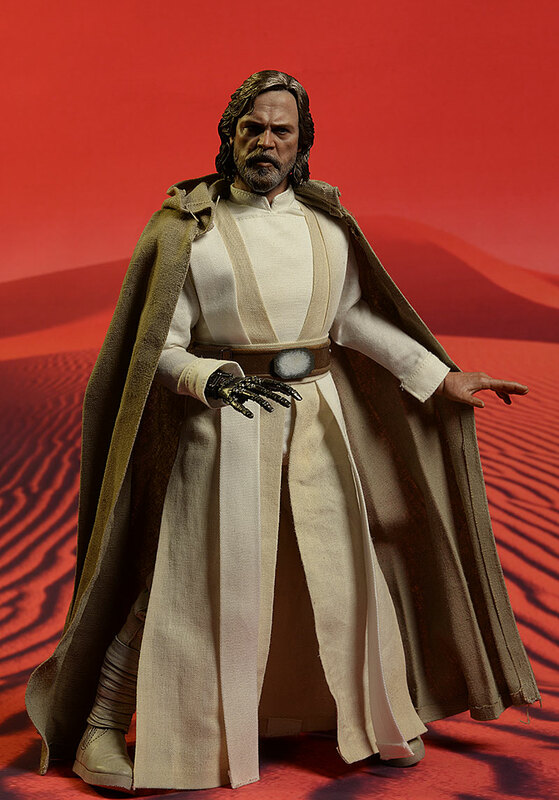 This is a figure selling for the full Hot Toys price, yet he comes with almost nothing extra. He does have three sets of hands in total. He comes wearing a relaxed left and a posed prosthetic right. There is an additional gripping right and splayed right, along with a left fist and posed 'force' left. The regular hands swap easily enough (and there's a couple extra wrist pegs just in case), but the fit on the rights, with that single peg, is a tight one. 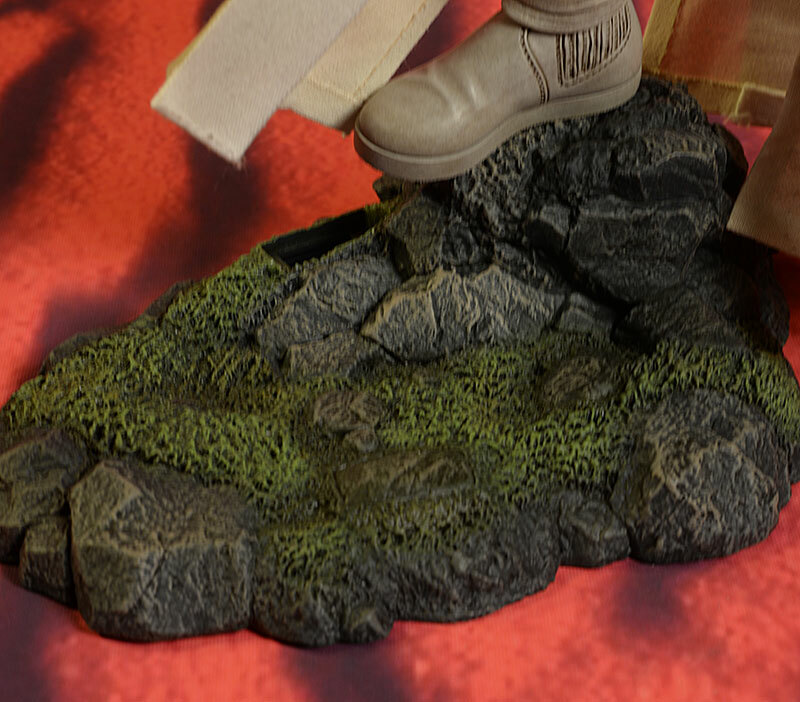 He also has a standard Force Awakens display stand, and a small, rocky, diorama base. The latter is small, and uneven enough to make it less useful overall. The outfit consists of his pants, shirt, boots, tunic, belt, and robes. The outfit is very clean, bright, and well made, with high quality materials and excellent stitching. There's a few loose ends here and there, but nothing major. As I mentioned earlier, the torso is padded up a bit, and it looks good. The outer robes are held over the shoulders with magnets, but these are fairly weak. I found that it was tough to get the edges of the cape to lay flat on the front of the tunic, but your mileage may vary. The outer robe is made from a pretty heavy material, and a wire in the outer edge would have proved useful. They did include one around the hood, and you'll need it to get the cloth to lay flat on his shoulders or hang correctly around his face. A wire in the outer edge of the robe itself would have made posing a lot easier, and opened up some more options. The sleeves on the shirt are a little short, making the wrists more obvious. This isn't a problem with the right hand, thanks to the sculpted surface. But the ball joint on the left is too visible in almost every pose. The hard plastic belt looks and feels a bit cheap, particularly considering the price point. But my biggest nit is with the boots. The two piece design was a smart move, but the sculpt and paint are mediocre at best, almost like they phoned it in. This particular figure, without much in the way of extras, is probably not going to be one that you spend a lot of time posing and re-posing. You'll find that one look you really like, and that's where he'll stay for a very long time. Hot Toys is charging their usual - $230. That's a lot considering the lack of accessories and the overall lack of complexity here. 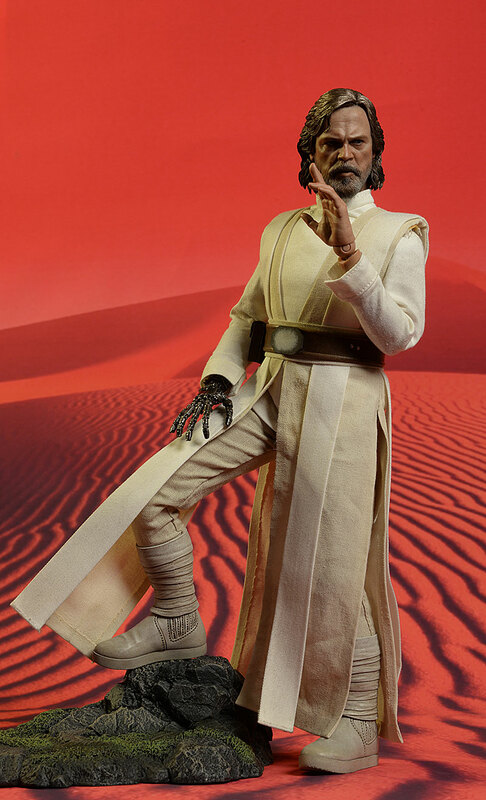 Had they crushed it with the costume or the likeness, I would be more forgiving, but there's nothing about this figure that sets it apart from the norm, and it lacks in a couple areas. It's a little tough to swap the right hands, but with a little heat or lube they'll pop on and off. Just don't squeeze the sculpted bits too hard in the process. Hot Toys charges a premium for their figures. It's all about brand and cachet. A license like Star Wars is never cheap either, but for a premium price you still have to bring a premium product. This time they miss the mark in several areas for me. The likeness is off, not by an extreme amount but certainly by more than I expect from them. The skin tone is too dark, the hair too bronze, the hands much too large. And while the cloth aspects of the costume are nice, the boots are a disappointment. Add in a noticeable lack of extras, and the price becomes a real issue. 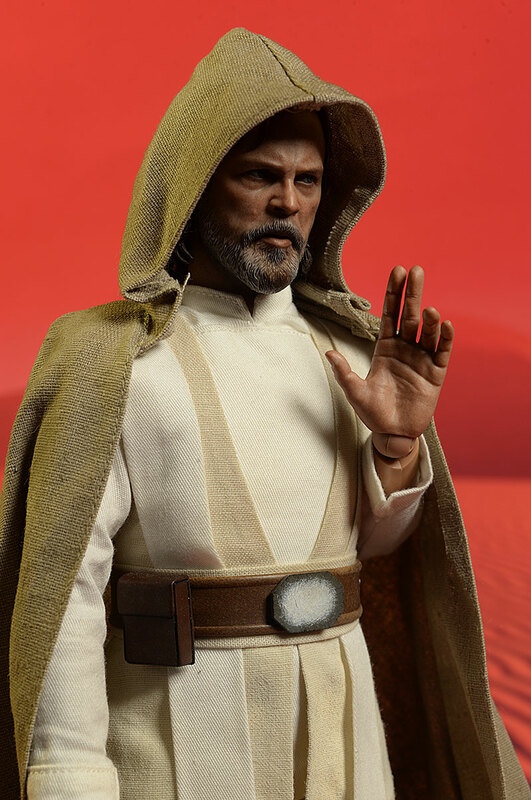 I'm sure we'll be getting another Luke very similar to this one based on Episode 8, so if you waited you probably made a good call. Of course, if you're like me and have trouble waiting, this release is still solid B work. It's just not Hot Toys at their best. - has him for $230. - is also at $230. - Sideshow carries him for $230 as well. My last Hot Toys review was for K-2SO. Before that were the other Rogue One figures of the Death Trooper Specialist, Death Trooper Specialist Deluxe, the Patrol Trooper, Chirrut Imwe, and Darth Vader. Other Force Awakens figures include Resistance Outfit Rey, and the the regular Rey with BB-8.